We have been lucky to have worked with the legendary calendar presenter Geoff Druett, over the past couple of days. 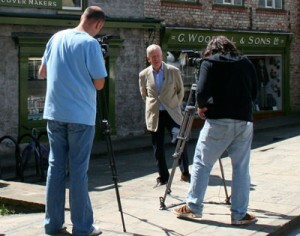 eko have been fiming for the last week in Malton, on a project for Ryedale district council. We are in the process of making a 20 minute film about the proposed developments to the town centre. We managed to get a lot of people interviewed, and after two days filming with Geoff, we were starting to become the centre of attention. We all had a good time though, the weather wasn’t too bad, and we got to hear lots of stories about Geoff’s exploits in TV land.